When you are pressed for time but still want to get a good workout, sprint training might be just the ticket. This type of workout is high intensity and is not only physically demanding, but mentally challenging as well. The more vigorously you exercise, typically the more calories you will burn. The best wind sprint routine comes with several variables. 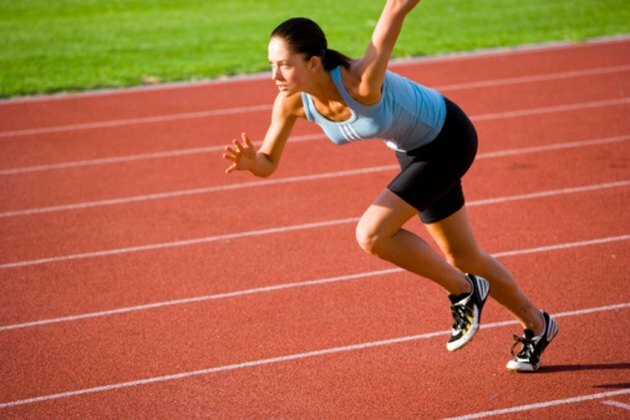 When you do sprints, you activate numerous muscles, joints, ligaments and tendons. Going into your workouts without stretching can increase your odds of getting injured. Prevent this from happening by doing six to eight dynamic stretches before your training sessions. These are performed by moving your body through a full range of motion. Perform stretches like arm crossovers, arm circles, deep knee bends, truck rotations, alternating toe touches, ankle bounces and leg swings. Once you have completed your stretches, the next thing you need to do is a light warm-up. Start off with a fast-paced walk, then jog lightly and continue to increase your speed until you are breaking a slight sweat and your heart rate is elevated. This slowly raises your core body temperature and further loosens up your connective tissue. Spend 5 to 10 minutes on your warm-up. The actual sprinting routine is intense, but basic in nature. The main thing is not how fast you move, but how much exertion you feel. After doing your warm-up, run about 85 percent maximum effort for 20 seconds. Use the talk test to gauge this. You should not be able to carry on a conversation at this point. Once you've finished your sprint, reduce your intensity to about 50 percent maximum effort for 40 seconds. Alternate back and forth for the rest of your workout and finish with a light cool-down jog in similar fashion to your warm-up. You do not have to start out doing 20-second sprints either. If it is more comfortable, make your sprints 10 seconds each and gradually increase your times as you fitness levels improve. TMake your low-intensity bouts twice as long as your sprints. You also have the option of resting completely in between your sprints. Unlike long, steady state cardio sessions, wind sprints should not be performed on consecutive days due to their intensity. Aim for three, 20-to-30-minute sessions a week on alternating days. This does not include your warm-up and cool-down. On your off-days, stick with steady state cardio or perform weight training. Although running is commonly associated with sprints, you do not have to use this form of exercise. Any type of cardio is suitable as long as you enjoy it. Low-impact cardio like indoor group cycling, elliptical training and stair stepping is actually more gentle on the back, according to the Spine-Health website. A recumbent bike that has a bucket seat and backrest is also a good option. Sprint training not only causes you to burn a high amount of calories when you do it, but you also experience a high caloric expenditure when you are done. This is commonly referred to as EPOC — post-exercise oxygen consumption. Simply put, the harder you work out, the more calories your body will burn when you are done. Such factors as your heart rate and breathing rate coming back down to normal contribute to this elevated metabolism. When doing sprints, you also have to forcefully contract your abs. This can help tone your midsection without even doing ab-specific exercises. Wind sprint routines are very intense. If you are new to exercise or have not exercised in a long time, make sure to talk to your doctor before attempting them.